Bizarro takes un-cluttering to a whole other level. Sort of. This un-cluttering thing has come along at a bad time for me, because I’ve reached a point where I want to live simply — I’m in a three room apartment but envy this place because it’s so much more efficient — and I’m also old enough to start thinking about what on earth my kids are going to make of all this crap. Which might make you think the un-cluttering craze came at a really good time, but Bizarro makes a solid point in that, well, just because you can’t see it doesn’t mean it isn’t there. Or somewhere. As you might expect of a writer, most of my clutter is books and papers, and I’ve tried to get the books down to things that aren’t at Gutenberg and that have some particular attraction that makes me think I’ll read them again, which still comes out to several bookcases. The papers, sigh, include a lot of bad writing from my early years that brings back memories and so can’t be thrown out, though perhaps it should be put into a box that would burst into flames upon my death. Meanwhile, I’ve been seeing rapid scanners that don’t require you to get up and position each page just so, and the idea of digitizing everything sounds good. But I haven’t even organized the spice shelf. Oh, and I don’t trust the Cloud for just the reason suggested in this Bizarro. The only thing worse than my suspicion that someone is going to go broke and their part of the Cloud will simply disappear is my suspicion that it won’t, at which point the concept of “virtual hoarding” comes into play. I think of the Cloud much as I think of that belt around the Earth in which most satellites and space junk dwell, maybe crossed with the Pacific plastic patch. It seems the Cloud is this vast conceptual area that we can’t possibly fill, but we’ve disproven that idea in so many other ways that it seems foolish to assume we won’t wind up with a crowded junkyard full of weird, unnecessary documents most of which can no longer be read by available technology. I’m also considering going to Tractor Supply and getting a couple of pitchforks so the kids can deal with all this stuff sensibly when the time comes, because that’s clearly as helpful as I’m likely to be. Doc and Raider have handled the whole fad much more sensibly, this being #7 in an arc that began here. By the way, I would have no idea who Marie Kondo was if cartoonists weren’t having so much fun with her. Apparently, she sparks joy in them. As for that “Hokkaido 2001 Dart Queen” sweatshirt, one of the things I don’t have, but would surely have never thrown away, was advertised in the Irish Echo back in 1983 or ’84. Some clever fellow in Belfast had gone to the DeLorean liquidation auction and picked up a load of the coveralls worn in the factory. Unfortunately, it was at the most starving of my starving-artist period, so I had to pass, my only consolation being that, if I had bought a pair then, I surely would not fit into them today. But I also wouldn’t be able to throw’em out. 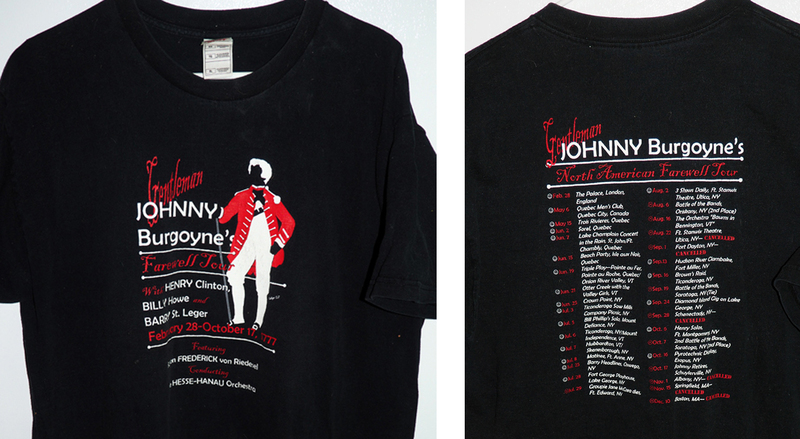 Any more than I could throw out my “Gentleman Johnny Burgoyne North American Farewell Tour” T-shirt, which began as a wisecrack in a tourism marketing meeting and turned out to be the hot-selling souvenir of the 225th Anniversary of the Battles of Saratoga. Though I guess I’ve just digitized it. The first step towards mnemonic cleansing. In any case, the juxtaposition is that about the time I was putting Dave Kellett’s cartoon in the folder for use here, I got my Notre Dame alumni magazine in the mail. I’m estranged enough from my alma mater that I usually just check to see who died and then toss the thing, but in doing so (only one dead guy and I barely knew him), I came across this full-page Pat Byrnes cartoon. … as seen here in 1996. The Byrnes piece is excellent as a standalone — a fun combination of dumb jokes and witty ones and a great overall title — but it’s also funny to me that the alumni magazine did a themed issue on oddball things that people believe in with serious misgivings, like conspiracy theories, extraterrestrials and crypto-critters. My overriding amusement being that I used to write for them years ago, but our working relationship ended when they declined to commission a story on divorced Catholics. There being a limit to the things they’re willing to believe in, even with serious misgivings. Though it happens more often than not. Many thanks for the nod! I sometimes say that if my electronic signature ever looks just like my real one, klaxons and lights will start up, and they’ll come for me. The real peril is that I’ll just make a K and stand there expecting the rest to pop up in a box. 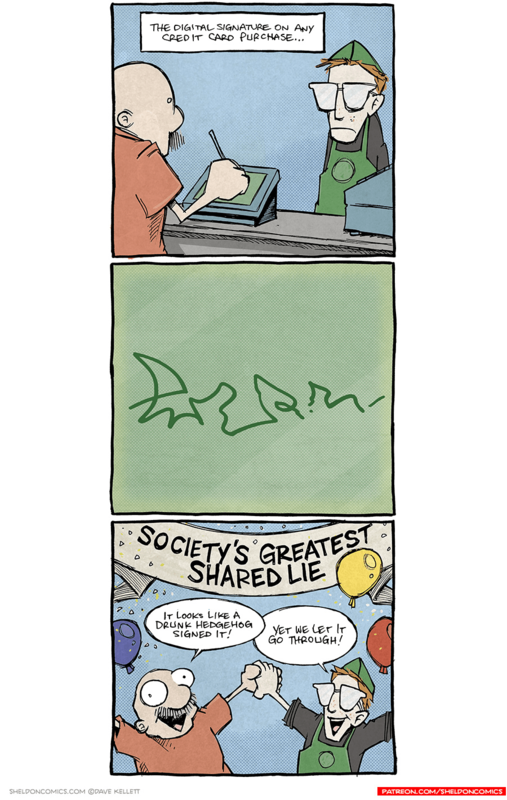 People miss the point of the signature, whether electronic or otherwise (and perhaps show great expectations of computer systems). The point of the signature, whether you write it on a check or sign it on an electronic pad, is not for someone else to recognize it, it’s so if you later dispute the document, YOU recognize that it was – or wasn’t – you who signed it. You dispute a charge (check, credit card, or what have you), and the institution (or legal authority or what have you) can say “is this your signature?” If you made a jagged scrawl, odds are you’ll at least see that it’s YOUR jagged scrawl and decide that you were in fact the one who signed the document. Of course, that process never (or seldom) actually occurs, but that’s the point of the signature – not for some other entity to see that the signature is yours, but for YOU to see that it’s yours, should the need ever arise. Back in the days of two-page credit card slips, I had an occasion where a slip with my card went through and I realized I had started to charge the car repair but then paid cash instead. The Visa person checked the slip, laughed and said, “That’s not even close to your signature.” Someone at the garage had fished the half-used form from the waste basket, filled it out, filed it and pocketed the money. Anybody could make a rough electronic scrawl that would look as good as the ones I make. I was happy to convince Visa without a protracted argument and no proof beyond my own word. My bank once cleared a check I had forgotten to sign.And this was more than 30 years ago, when actual people were there.That bank no longer exists, and what’s left of it after 5 mergers is now closing many of its branches. In re moving your scanned documents “to the cloud,” remember that “the cloud” just means “other people’s computers.” So your very insightful concern about the part of the cloud you’re using disappearing without warning can be guarded against by also having the documents on a couple of disconnected drives of your own—one in your house and one at a friend or relative’s (or in a safe deposit box). A 200+GB SSD is pretty cheap lately (and probably a better solution than a spinny drive for long-term backup). And it will happily hold all your scans.